Qamar Ajnalvi is one of the greatest Urdu novel writers. He wrote near ten stories. He chooses the Islamic history for his books. Besides novels, Qamar wrote many films stories. 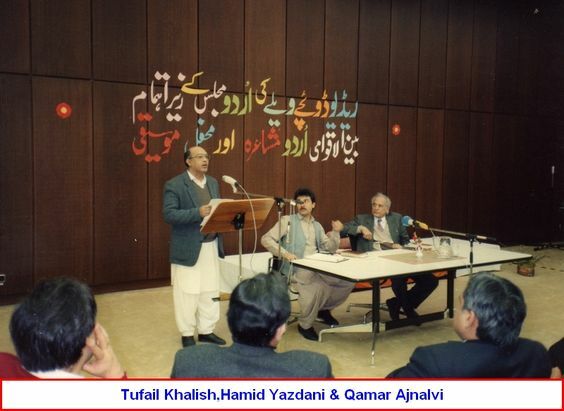 There is no doubt that he was the great writer like Naseem Hijazi and Inayatullah. He stands in the first row of 20th century Urdu writers. Qamar Ajnalvi was born on 1 March 1921 in Ajnala district, Amritsar. His father’s name was Din Muhammad. He was the single child of his parents In 1940, his family moved to Lahore and settled there. After migration Ajnalvi spent his whole life in Lahore. In 1944, he married with Begum Amtul Hafeez. Qamar Ajnalvi has died at the age of 73 on 30 May 1993 in Germany. Qamar Ajnalvi wrote many Urdu movies scripts. He collaborated with various filmmakers. He considered the great story writer in the early days of Urdu films. Qamar wrote the scripts of below films. He also wrote the dialogue of famous film Anarkali. Besides movies, Qamar Ajnalvi got fame from his novels. His first novel was published in 1938 with the name of Shaheed Pujaran. After this, he wrote many great books on Islamic history and the context of Indo-Pakistan. Ajnalvi wrote below mentioned novels. Moreover, you can download these books by clicking them from The Library Pk site. The main theme of the novel the search of Statue of Gautam Budh. This statue was made after the death of Gautam Budh. The importance of the statue because that it had the ashes of Gautam Budh in it. The hero of the book (Tharo Keship) found this holy statue. He faced many difficulties in his way. But, he succeeded in his aim by courage. It is a great history book. This novel shows the excellent knowledge of Qamar Ajnalvi on comparative religions. Jang e Muqaddas wrote in the context of Crossed wars after the reconquest of Bait-ul-Muqddas. The two heroes of Crossed Wars Richard the Lion Heart and Sultan Salah-u-Din Ayubi came close one another. It is the great history novel for book lovers. According to the writer, Chah e Babul is the great love story of the history. This book describes the history of Babul civilization and its conquest. The hero of novel Mehar Talib came in Babul to plain the ground of Cyrus the Great victory. Qamar Ajnalvi also points out Haroot and Maroot angels that landed on the Babul. Jahan e Loh o Qalam describes the World politics and its scenario. The Lala Rukh novel wrote in the context of 1857. This book explains the failure of war of Independence 1857 and end of the Mughal Rule. British troops mascaraed the Muslims in sub-continent. The novel outlines the difficulties of Mughal princess and women after the end of the Mughal rule. Wali Ahad another great history book of Qamar Ajnalvi. This novel wrote in the context of the British invasion on South Indian Muslim states and their struggle for their independence. The main theme of Dharti Ka Safar Muslim migration from India to Pakistan. It is the great migration in human history. Almost 40 Million People migrate from India to Pakistan. This book points out the mascaraed of Muslims by Hindus and Sikhs. Baghdad Ki Raat another history books of Qamar Ajnalvi. The main topic last days of Abbasid Khilafat and Qarmtia movement. Pandare is the biography book of Nawab Karim Khan Pandare. Parthaal novel described the war between South Indian Hindu and Muslim states. War start from a daughter of Jeweler (Parthaal). She loved the Prince of Dukan state, and at the same time, Raja of Hindu state want to marry her. It is the compelling history novel. Shamsheer story firstly wrote for a film. But, after this novel published in book shape. The central theme of novel love has its value. It is below of caste, status, etc. This story captured the attention of readers from the first line to last paragraph. Laado novel is the story of a mare. This mare has a great quality. The novel revolves around this mare and its owner. No doubt, Qamar Ajnalvi is the great writer of Urdu language. He showed excellent grip on his stories. I hope you liked his biography. You may also like Shaukat Siddiqui: Novel writer.